Michigan basketball coach John Beilein ordering lots of 'sunshine' for struggling Tim Hardaway Jr.
Posted on Tue, Feb 7, 2012 : 4:31 p.m.
Michigan coach John Beilen on sophomore Tim Hardaway Jr., above, and his recent struggles: "He really wants to be the ultimate perfect player, and no one is." John Beilein has never once wavered from his stance regarding the on and off play of star sophomore wing Tim Hardaway Jr.
On Tuesday, the Michigan basketball coach kept that trend going. "He really wants to be the ultimate perfect player, and no one is," said Beilein, whose team will visit Nebraska on Wednesday (8:30 p.m., BTN). "He's a young man. Still 19 years old, and he's been starting since the day he (walked in) here. And there's a lot on (a player) with a father with a tremendous legacy. "So, we just keep building that young man (up) and give him a lot of sunshine." Hardaway's struggles, notably in Big Ten play, have been widely debated throughout Michigan's season. Since opening league play with a dominating 26-point performance against Penn State, Hardaway -- the son of famed ex-NBA point guard Tim Hardaway -- has since slumped to a 36.7 Big Ten shooting percentage, with a 21.2 percent success rate from beyond the arc against league opponents. He's still averaging a team-best 14.7 points per game this season, but shooting a team-worst 27 percent (37-for-137) from 3-point range. Tim Hardaway Jr., right, is averaging a team-best 14.7 points for Michigan, but shooting a team-worst 27 percent (37-for-137) from 3-point range. Often described by Beilein as a player who puts immense pressure on himself to perform each time down the floor, Hardaway's season seemed to hit rock-bottom Sunday during a 1-for-10 performance against Michigan State. "He's just put a little bit too much pressure on himself," Michigan senior co-captain Stu Douglass said of Hardaway. "We're just encouraging him to stay within the offense, to keep working within the offense and find what works for him. "And (making sure he) knows we don't expect him to make and take all of these tough shots. He's a huge part of our offense, but he doesn't have to do the spectacular every single play." Following the Michigan State loss, Hardaway said his chemistry with Michigan freshman point guard Trey Burke was coming along "a little more slow(ly)" than he'd like. On Tuesday, Beilein dismissed any notion that there may be chemistry problems inside his locker room, saying "I have not seen one bit of chemistry issue, ever, on this team." As far as on-court chemistry goes, however, Beilein did admit there are times when the offense goes through growing pains with a freshman point guard. 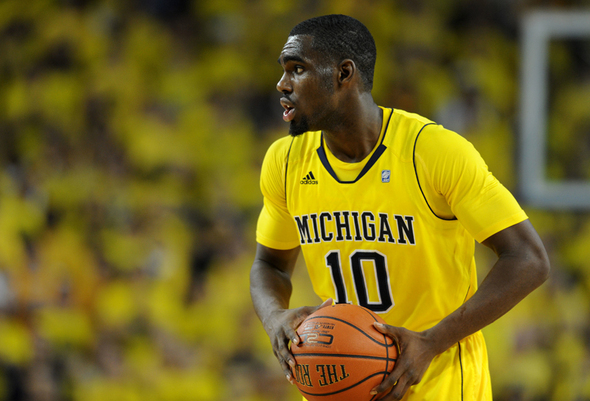 "We have three sophomores and a freshman with the ball (in his hands) a lot of the time," Beilein said. "It's not (Kevin) McHale, Larry Bird and Dennis Johnson out there that have been playing together forever. They're still learning things all the time. "We have a freshman quarterback. Just like when (former Michigan point guard) Darius Morris was a freshman, what was his timing like with people? That's natural, and that's on every team." Timing issues aside, Hardaway's struggles have remained consistent. Beilein said he doesn't believe the sophomore is tired after spending extra time this summer competing with Team USA's Under-19 team. And, when asked if he'd like Hardaway to become more of an inside-first player, rather than a heavy outside shooter, the coach said he's not sure. "He has to continue to work at 'what is the right play at the right time?'" Beilein said. "And just let the game come to him a little bit more. Whether it's inside or out, I'd hate to see him turn down an open shot. "I think he turned down one of those against Indiana when he was wide open because he'd just taken one he probably regretted." Following the Michigan State loss, Beilein said he and Hardaway watched plenty of film together, and had a discussion about all aspects of his game, including his overall body language throughout the ups and downs of a 40-minute contest. And, as he has all season, the Michigan coach said his star was completely receptive with every lesson being thrown his way. As far as his teammates go, Burke said after the MSU game that Hardaway was Michigan's "best player," and he that the team had his back throughout. Douglass echoed that sentiment Tuesday, saying Michigan is aware just how good Hardaway can be, and it's more than willing to ride out the dark cloud hanging over his game to get near Beilein's goal of sunshine. "We'll just keep encouraging him," Douglass said. "That's all we can do. Wed, Feb 8, 2012 : 7:30 p.m.
cutty240- poor poor timmy hardaway jr. Its so tough getting criticized for taking way to many 3 point shots and hitting at a 27% clip. Its tough getting criticized for playing no defense and being a turnover machine. He has the capability to be an outstanding player but right now he is a liability for Michigan when he puts up three's. He is putting way to much pressure on himself to dominate and you are exactly right he needs to let the game come to him and he will be more consistant! You can see when he does not force a three he can drive on anyone because he is so athletic and quite frankly Beilein should tell him that he is only to drive or take shots within the free throw line and if he attempts a 3 he will get benched. But hey I am a hockey guy not basketball so what do I know, except what I see on TV?! Go Blue!!! Wed, Feb 8, 2012 : 6:28 p.m.
Who cares about February? Just get into March Madness and get hot at the right time. Wed, Feb 8, 2012 : 2:56 p.m. Sounds like Coach B is taking the right approach, and it also sounds like his teammates have his back. That's good news. A couple of losses this year would have been wins had TH been performing to his abilities....but looks like patience is in order and we'll just have to hope that he can find his groove and start to contribute in games. Wed, Feb 8, 2012 : 2:46 a.m. Wed, Feb 8, 2012 : 2:43 a.m.
Tough to be Tim Hardaway Jr.If you people remember John Elway's son quit college football because of the presure.Tim Jr just nees to let the game come to him,instead of the other way around.